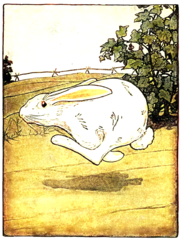 One of the many signs of spring is cute bunny rabbits like this one on the 1902 cover Beatrix Potter’s Tale of Peter Rabbit. Potter, who wrote and illustrated the book, was the first children’s author to dress small furry animals in jackets and dresses, perhaps inspired by the many small pets she kept as a child. 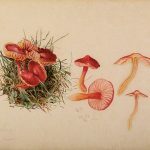 Potter’s first artistic reputation came from her detailed drawings of fungi spores. Her research into the spores and their germination led to a paper she presented to the Linnean Society in 1897. As a woman, however, she wasn’t allowed to attend the society’s proceedings or read the paper. In 1997 the Linnean Society issued an apology to Potter who died in 1943. 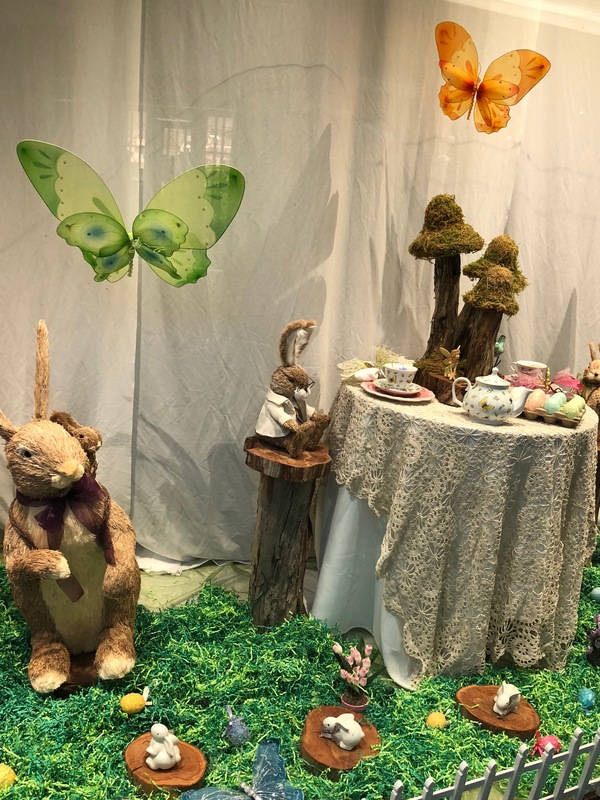 The Tale of Peter Rabbit was born from letters Beatrix Potter wrote to the children of her former governess about her visits to The Lake District or Scotland. 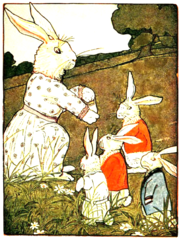 One of the letters was about four little rabbits named Flopsy, Mopsy, Cottontail, and Peter. Potter later revised the story for publication. It first appeared in 1902 with illustrations drawn by Potter herself. The story resonated in the growing market for children’s books and remains a perennial favorite. Peter Rabbit, in case you’ve forgotten, didn’t listen when his mother told her children not to go into Mr. McGregor’s garden. She warned her children their father had an accident there and wound up in Mrs. McGregor’s pie. Peter sneaks under the gate to eat Mr. McGregor’s veggies, gets a tummy ache, has to hide from Mr. McGregor, and loses his jacket and shoes while making his escape. 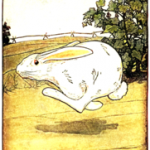 If you have six minutes to spare, listen to Phil Chenevert read the story while you gaze on Beatrice Potter’s illustrations. 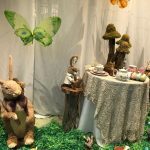 Those charming illustrations morphed into spring decorations at my local shopping mall where oversized rabbits wear ties and glasses while they sip tea. Illustrations: Photo of shopping mall display by author. All other pictures from Wikimedia Commons. 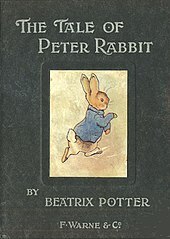 Cover of First Edition of The Tale of Peter Rabbit. 1902. Public Domain. Peter Rabbit and Family. 1918. Public Domain. 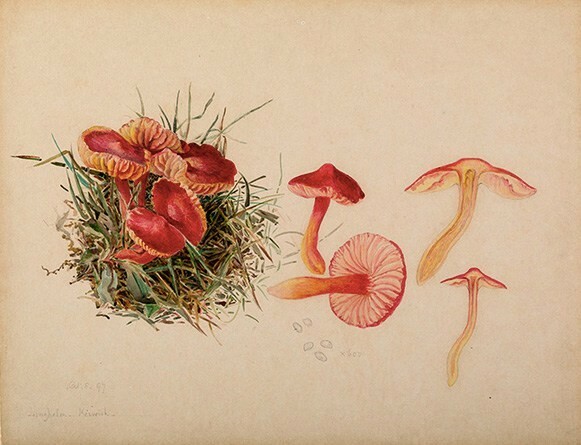 Illustration of Reproductive System of hygrocybe coccinea, a fungus. 1897. Public Domain. Peter Rabbit Running Away. 1918. Public Domain.